The theatrics of the Michael Brown funeral rally is over. This funeral couldn't have been better scripted if it came from Hollywood. Based on the convenience store video, Michael Brown was clearly not some innocent kid skipping home thinking about the first day of school, no. He was a thief and he assaulted the owner of the store when confronted about stealing some swisher sweet cigars, which are used to make marijuana blunts. At Brown's funeral however, Michael the violent thug and thief was miraculously cleansed and elevated to that of "Saint Michael". Who was Saint Michael you ask?. Well let me explain. According to his friends and family "
"spreading the word of Jesus Christ" . The scripture goes that Saint Michael was walking along spreading the word of Jesus Christ, when the devil possessed the store owner and tempted Saint Michael to go into the convenience store with his disciples and steal some swisher sweets cigars. However, one of the ten commandments is "thou shall not steal". This was in essence "The Last Temptation of Saint Michael". Saint Michael was able to overcome the temptation of the devil, and he laid his hands on the store owner jacking him up and yelled DEMON BEGONE!!! He thought he exercised out the demon so he was walking out the store, when he sensed the demon reappear, so he flinched back at the demon and said to the demon "DON'T MAKE ME HAVE TO EXERCISE YOU AGAIN"! Saint Michael still didn't realize that he was in possession of the cigars though. The devil wasn't finished however. He hoped out of the store owner and into the white cop Darren Wilson. Officer Wilson confronted Saint Michael as he was walking down the street with his disciples. Saint Michael put his hands up and said that his purpose was to spread the word of Jesus Christ and he wouldn't be stopped. That is why the devil who controlled Officer Wilson shot the peaceful giant. Testify to the Miracles of the gentle giant! Saint Michael's Uncle and false prophet pastor Charles Ewing of the Friendly Temple Missionary Baptist Church compared Saint Michael's death to that of Jesus Christ. Well let's see. 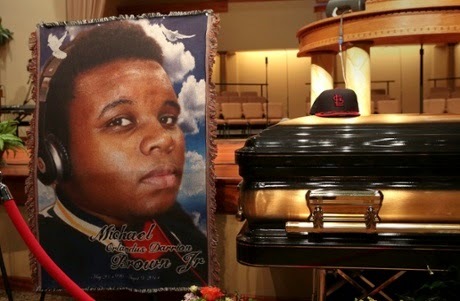 Michael Brown was buried on Monday. He should have risen from the dead on Thursday but that didn't happened. Nothing worse then deceptive comparisons. Though he did for a moment made some swisher sweets cigars disappear as a miracle and he did exercise the demons out of the store owner. He's still not even close to being in the league with Jesus Christ however. Saint Michael's Uncle stated that "Michael Brown's blood is crying from the ground, crying for vengeance crying for justice". I find that statement kind of odd coming from a supposed Pastor. Those who are Christians believe that Jesus Christ died for the sins of mankind. Jesus didn't ask for vengeance nor justice in his death. I guess the good pastor and disciples of Saint Michael forget those details. Furthermore, blood is liquid, Liquid can't cry it can be shed, but it can't cry. A soul can cry though. One would think a Pastor would again know the difference. Some believe that Saint Michael is really that of a higher power, just ask Sarah Kinney Gaventa who "preaches" at the Saint Paul Episcopal Church in Ivy Virginia. According to her, Michael Brown is Jesus Christ. Some helpful tips to help young black males to stay out of trouble with the police. "Obey the Law" is roughly 90% of the solution that will contribute greatly to them not having a problem with the police future. The black community and the art of "Misdirecton". Misdirection " is a form of deception in which the attention of an audience is focused on one thing in order to distract its attention from another". Here in Baltimore two weeks ago, a 3 year old black girl McKenzie Elliott was shot and killed as she sat on the steps of her house on York Road in North Baltimore. Two black males got into a shootout , and one of the bullets hit McKenzie. I will give the Police Commissioner Anthony Bates and Mayor Stephaine Rawling Blake credit for stepping up and speaking out on this murder. However, this was not news worthy to go national of course for "obvious reasons".Well at least the Waverly Community dedicated their annual night out in her honor. Local radio talk show host Clarance Mitchel the 4th which we all call him C4 asked the question which made perfect sense. Idiots here in Baltimore held a rally downtown in honor of Michael Brown in Fugerson Missouri, yet there was no rally calling for justice for McKenzie Elliott. I called in basically calling these blacks misguided hypocrites. If the country ever becomes a police state in which martial law is the rule of the land, then blacks would have something to have a grievance about. Until then, they should focus on the real problems face them, and it's in the mirror and in their community, and they are holding guns. Occupy Fergurson is nothing even remotely similar to the 1960's Civil Rights movement. A difference between night and day. When I look at the ghetto trash stinking up Fergurson, I just laugh when foolish blacks dare to compare this open display of destruction, looting and anarchy to the peaceful, dignified civil rights protest by blacks of the 1960's. There is no compassion. What's going on in Fergurson Missouri is pure chaos. If anything, Fergurson has become the new home for the reincarnation of the Occupy movement. What's going on in Fergurson has far more to do with the race agitators, anarchists, vandals and looters then it does about supposedly wanting justice for Michael Brown. I doubt that blacks mainly young blacks have no idea how bad they are appearing to the rest of the nation in how they are carrying on in Fergurson. I would love to see a national poll conducted gauging how the nation is viewing what's going on in Fergurson Missouri as either positive or negative. The Occupy movement started out positive for minute also . People supported their original cause of bring attention to the greed and abuse of Wall Street and the financial system, but after awhile, they lost focus of what they were doing, and their movement became a breeding ground of crime, drug use, vandalism, theft and violence. When they lost the support of the public, they quickly fell apart completely and disappeared. What's going on in Fergurson is no different. People across the county are asking themselves, why are these people acting like animals. They aren't sure what vandalizing and looting stores have to do with seeking justice for Michael Brown. Tthey would be correct in asking that question. Both have nothing in common. These people are acting out in self interest only, it has nothing to do with Michael Brown. Here's a question to ponder. How can all of these malcontents be rioting, looting and vandalizing on a nightly basis yet still hold down a job? Oh wait, is it strongly possible that none of them have jobs the reason they can be doing what they are doing in Fergurson? Fox News interviewed one of the these fine upstanding and concerned protesters in Fergurson. The dignity and class of the black generation from the civil rights era is definitely not present in this generation of blacks. From the dignified generation to the ghetto acting generation. Acts like this are truly helping to bring attention to Michael Brown's death right? MSNBC in it's coverage has shown it's sympathetic in favor of Michael Brown, but even they aren't immune to the wrath of the mob. Just ask Chris Hayes and his cameraman. Ironic that the animals are attacking their ally. Throwing stones at Chris Hayes and his cameraman helps to bring attention to Michael Brown's death how again? 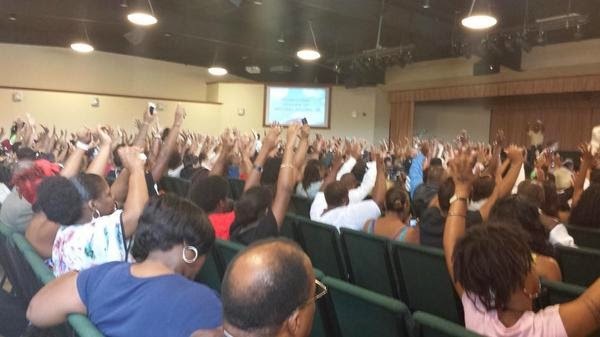 Micheal Brown's death has value to the black community for one specific reason. The racial dinner bell has been rung in Fergurson Missouri, and the black racists and the self victimized black grievance folks have come running. Looks like Eric Garner has become yesterday's news in the eyes of the black agitators. The newest member of the black person's death who has value club is Michael Brown. This is a very exclusive club to be a member of. Current members are Trayvon Martin, Eric Garner to name a few. The main perk of being a member of this club is that black people actually act like they care that you were killed. The only stipulation to be a member is that a black person has to be killed by a white person mainly a cop. Unfortunately if you are black and are killed by another black person, it doesn't count. It's not a bad deal, when you think about it. If you are black and are killed by someone who is white, the national media will immediately champion your death. You'll get a special guest appearance by either Jesse Jackson but mainly Al Sharpton. Blacks will protest in your honor etc. Now if you are killed by another black person, you'll still be mourned, but it wil only be by your immediate family and friends. Some may be asking am I being sarcastic or am I being absurd. Actually I'm being honest. The macro problem facing blacks is other blacks not white cops. I'm not sure what was the situation surrounding the shooting death of Michael Brown, the facts will come out in due time. The racial agitators who have ascended onto Fergurson like vultures eying to pick a any scraps they can find aren't going to help this process on bit, if anything they are gong to hinder it. I've following the case of the Eric Garner. He's a 43 year old black man who died after being subdued by the New York Police Department. The reason I've been following this story is frankly due to me not having no other choice. It's been all over the news both locally and nationally. In sarcasm, I wonder why. Of course there are two factors that usually make a cop involved death of a suspect go national in the media. The first factor is that the victim has to be black, and the second factor is that the cop has to be white. From what I understand from watching the news so far, Eric Garner was selling cigarettes in New York on the street and was subdued by the NYPD. It hasn't taken long (surprise) for the racial agitators like Al Sharpton to position themselves into this story into what went wrong that led to Eric Garner's death . I'm not going to go deep into this, because most people more then likely already know about it the story. What I will say is this. At this time, there appears that there was no racial motive behind the apprehension of Mr Garner. According to the Corner's office report by Julie Bolcer Mr. Garner was killed in part to neck compressions from a choke hold administered by one of the officers as well as chest and prone positioning during his apprehension. The officer who issued the choke hold on Mr. Garner was officer Daniel Pantelo. The NYPD said that they have removed his gun and badge. Notice that I said that Eric Garner was killed " in part" due to the choke hold and his positioning. None of that is to be ignored of course, but what will likely be ignored by the media and the race hustlers is the following in the Corner's report. "Asthma, heart disease and obesity were "contributing factors" in his death". Mr. Garner was 6 foot tall and weighed 350 pounds." Again, I want to make myself perfectly clear. I am not excusing how the NYPD handled the arrest of Mr Garner, because I'm not. What I am saying is that the vultures who have sensationalized this case are going to gloss over the medical condition of Mr Garner prior to his death. Should the officers be punished if they didn't follow proper apprehension procedure? The answer is of course. I dont't believe anyone with common sense would disagree with that. 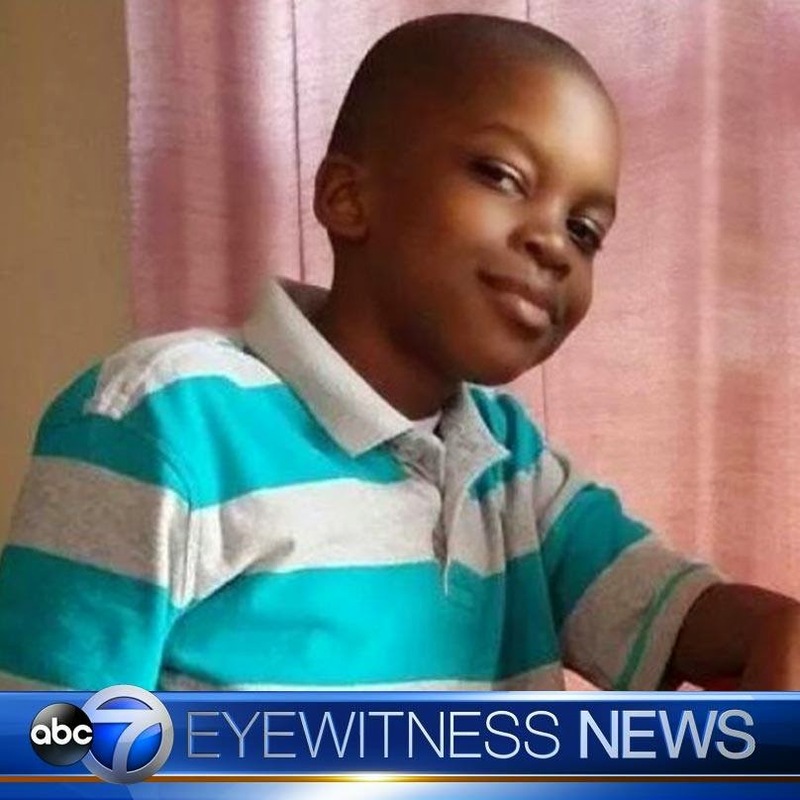 What I don't want to see is this case being racially sensationalized. 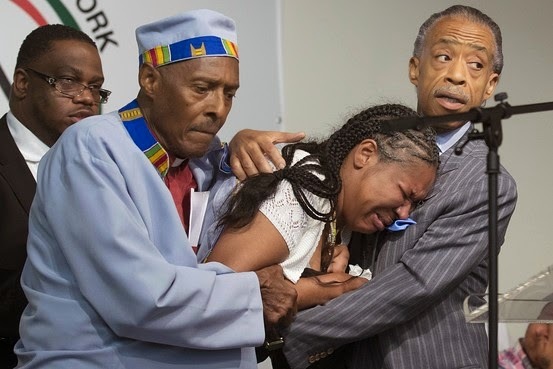 I don't know the statistics, but I wonder how many times has Al Sharpton shown his head, when a black person was killed while being subdued by a black police officer? Since blacks killing black (which is by far more way more common) doesn't grab the news headlines, I guess their lives aren't that important. Funny I would say that, because I said the exact same thing during the Trayvon Martin irrational freak show behavior circus. This is starting to resemble that unfortunately. This is the recipe. 1.Mix in one part irrational thinking people who are racially motivated people "mainly black"
"a real test of Mayor Bill de Blasio's pledge to bridge the gap between police and minority communities." Not to excuse cops for overreacting at times, but I have to ask this question. How many blacks die in either police custody each year compared to blacks who are killed by other blacks across America? I would really like to know the ratio of that. My thinking is that it is easier to focus on incidents that rarely happen rather then it is to focus on an issue that is out of control like black on black genocide. This is what I meant by irrational thinking people who are racially motivated in their ignorance. This is what it has come to. Just like with Trayvon Martin, little kids are being exploited by their ignorant racially obsessed parents. The sign that little kid is holding makes me sigh in pity. 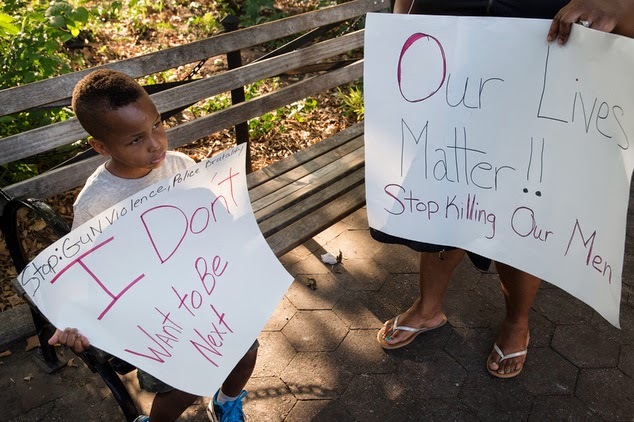 I can excuse the kid, he doesn't know better, but the mother who is making him hold that sign is too stupd to realize that her son has a far greater chance of dying due to another black person's gun then he is by that of the gun of a cop. The sign she is holding reads "stop killing our men". Again, another exhibition of sheer stupidity. The problem in America isn't the cops killing black men. IT'S BLACK MEN KILLING OTHER BLACK MEN! !If the lives of black people mater specifically that of young black men, why is it that the only times signs like this and blacks who say such things happen, when a black person dies in an incident that rarely happens?